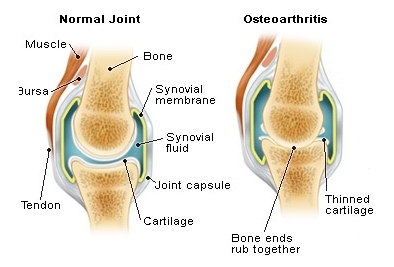 Osteoarthritis, also known as degenerative arthritis or degenerative joint disease, is a group of mechanical abnormalities involving degradation of joints, including articular cartilage and subchondral bone. Symptoms may include joint pain, tenderness, stiffness, locking, and sometimes an effusion. When bone surfaces become less well protected by cartilage, bone may be exposed and damaged. As a result of decreased movement secondary to pain, regional muscles may atrophy, and ligaments may become more lax. Primary osteoarthritis is a chronic degenerative disorder related to but not caused by aging, as there are people well into their nineties who have no clinical or functional signs of the disease. As a person ages, the water content of the cartilage decreases as a result of a reduced proteoglycan content, thus causing the cartilage to be less resilient.Stem cell therapy has been demonstrated to induce profound healing activity in various forms of arthritis. Besides healing of damaged tissues, stem cells have the unique ability to modulate the immune system so as to shut off pathological responses while preserving ability to fight off disease.